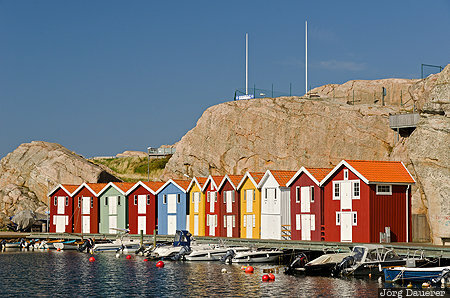 The typical colorful wooden huts of Smögen at the coast of the Baltic Sea in front of rocks below a blue sky. Smögen is in Västra Götaland in the south west of Sweden. This photo was taken in the afternoon of a sunny day in September of 2014. This photo was taken with a digital camera.